Finding an organic turkey in your regular grocery store is getting easier all the time. Stuffing the turkey seems to be the problem for most Advanced Plan eaters. I hope this recipe helps you, whether you've prepared multiple turkeys over the years, or if you've never been the chef for a festive holiday dinner before. I know this looks like a lot of ingredients and a ton of preparation, but it really is a matter of chop, sauté, season, and stuff! When you've done it once, you'll be amazed at how easy it is. Read the recipe through, chop everything, and have it all at your fingertips before you begin, and you'll find it a breeze. (If you love thyme, add thyme. Gently melt the 2 - 3 tablespoons of butter and olive oil in your largest sauté pan. Add the celery, onion and garlic, and lightly sauté over medium heat until they just begin to sweat. (The celery will become a brighter green.) 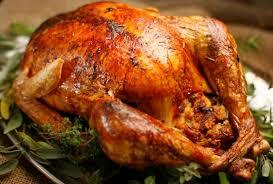 Understand that the stuffing ingredients will fully cook when you roast your turkey, so don't worry. . . Enjoy! Add your spices. I use salt and pepper to taste, a healthy tablespoon full of dried sage, and about the same amount of fresh, finely chopped parsley. (You could use dried. . . If you do, use less.) Again, the amount you use is largely dependant on the size of your turkey and the amount of your stuffing. Stir to distribute the spices and TASTE. Adjust seasoning to suit your taste.